St. Michael is a stewardship community gratefully acknowledging God as the giver of all of our gifts, and we honor Him by giving back of our time, talent and treasure. It is this grateful awareness that reminds us to keep God first in all aspects of our lives, making us more like Christ who came not to be served, but to serve. Whether you are seeking a stewardship ministry to be more involved in the community, or one that allows you to spiritually connect privately, here at St. Michael we have many wonderful opportunities. Click here for the list of ministries and more information. 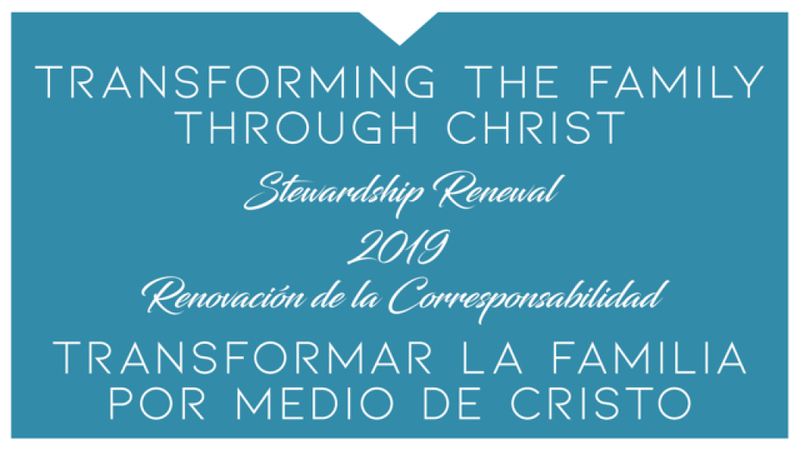 Join us in "Transforming the Family through Christ" and fill out your Stewardship Commitment today for 2019. Commitment cards are available in the Parish Office or online by clicking here Online Commitment Card. Congratulations to our Ministry Quest winners! Missed Commitment Weekend? It's not too late. Please bring your commitment card to mass and put it in the offertory plate, or click here to complete online. How has Stewardship affected your life? Tell us about it! Become a Lay Witness Speaker at Mass. Please contact Annette Lee, Stewardship Coordinator, if you have any questions. 817.510.2718 or Click Here to Email. Want to join the Stewardship Council? Are you a Ministry Lead? Here's the link for your volunteer list.